What has come to be known as a favorite day of the Congress, the Host Country day was hotly anticipated by all delegates. 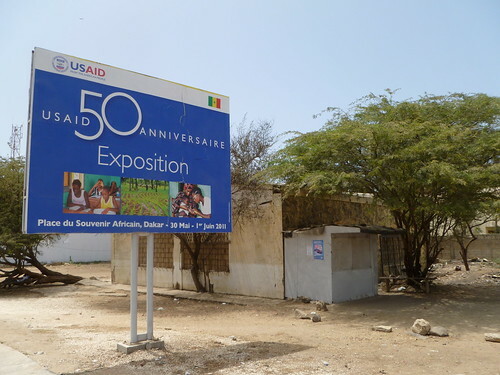 Senegal’s Host County day was a full day of cultural programming and fun. We began the day with a trip to the famed African Renaissance Monument. Speaking to our tour guides and Senegalese delegates, we learned that the Monument means much more to the country, the region and the continent than simply being a beautiful statue. The symbolism has deep implications. 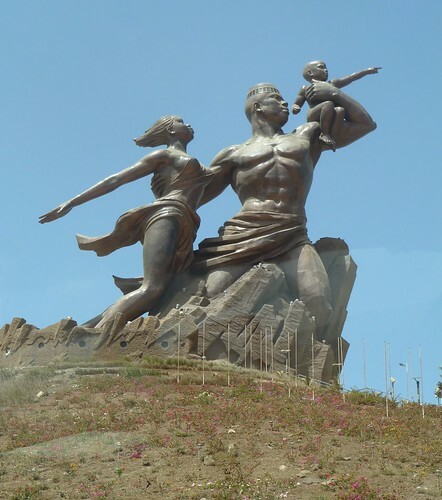 The Monument shows a strong African man, woman and child, highlighting the importance and strength of the African family unit. The child is pointing out into the distance. When I asked the tour guide “What direction is he pointing?” he simply answered “..to the future”. This symbol shows that African children are the future of African development, progress and greatness and that the best is yet to come for Africa. Also, you will notice that the woman is reaching her hand behind her. This represents the fact that African families must not only invest in their own families’ success and well-being, but bring their communities with them. After visiting the monument, we went to a Sand Painting Gallery for an experience none of us expected. As we walked past a beautiful Baobab tree and into the gallery, we heard a Senegalese musician playing the saxophone and saw various stands selling African crafts and souvenirs. We gathered around the table for a demonstration of an artist creating a Sand Painting. 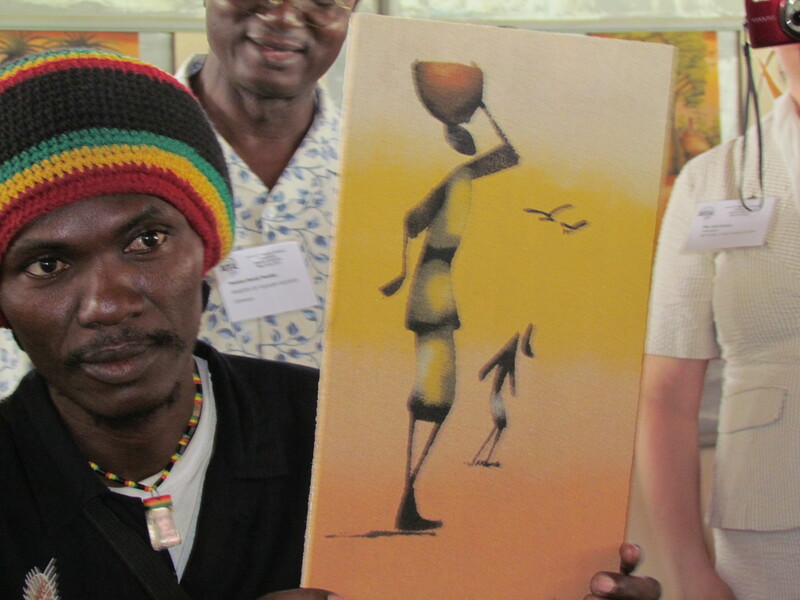 The artist took a blank canvas and began to paint with glue that we learned is the gum from the Baobab Tree. 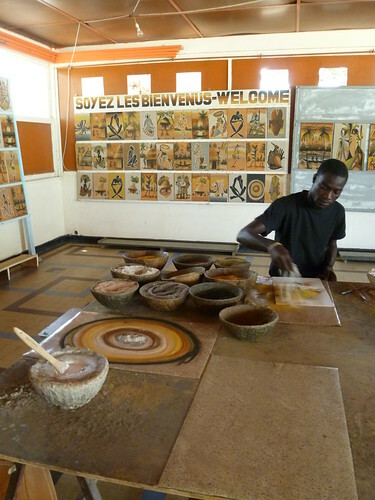 Then, after creating what looked like a vague figure of a woman in the glue, he began to work with about 10 different bowls of natural Senegalese sand from different regions of the country. The artist delicately took a little sand from this bowl and a little sand from that bowl and sprinkled it on the glue in what seemed to be a rather nonchalant manner. After a few minutes, the artist picked up the canvas, slammed it on the table to get rid of all of the extra sand and all of the delegates literally gasped at the beautiful painting we had before us! I can confidently say that none of us were expecting to be that wowed by the end product. Many delegates bought 2, 3 or even 4 paintings from this gallery and my 2 paintings are among my favorite art pieces I have ever bought on the continent. After the Sand painting gallery, it was time for shopping at the Soumbediome Market. Delegates got the opportunity to meet local artists and merchants and purchase souvenirs such as handbags, jewlery, sculptures and art. 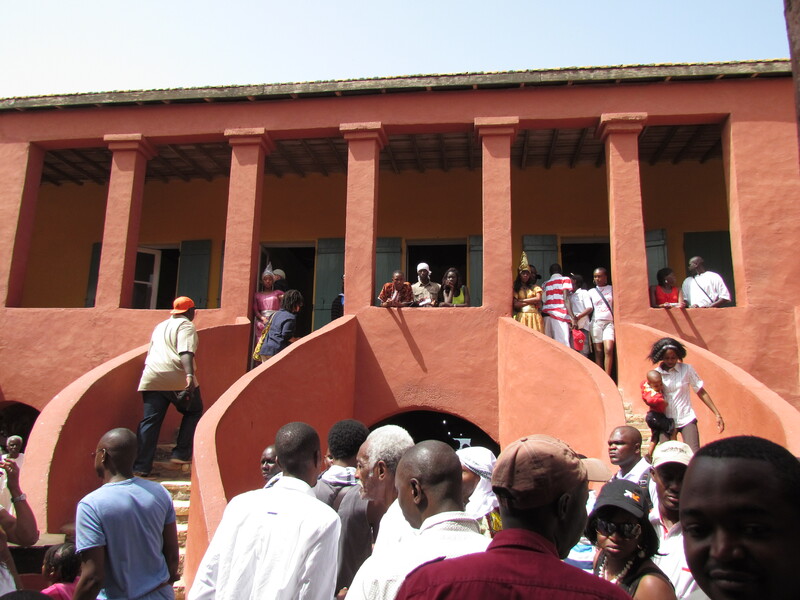 Perhaps the most anticipated part of the day was the trip to Goree Island. We boarded the ferry and enjoyed the 20 minute boat ride with a beautiful breeze. Many delegates didn’t know what to expect…of course, we all knew that it was a heritage site with old slave quarters and that the island represented the exit point of many African slaves the new world. I, for one, was expecting a solemn, dark and very serious place. Upon arrival, we saw about 100 African children jubilantly playing around in the ocean together and heard some beautiful traditional music…the mood was festive, not sad! We immediately walked to the restaurant to sit down for lunch which included fish stew, sweet potato, cabbage, and wonderfully spiced rice. After lunch we began to explore the island. Many markets, art stands and restaurants (including a pizza place) lined the dirt paths. The architecture reminded me of an Mediterranean town and we were having a beautiful day. But then we went to the House of Slaves (La Maison des Esclaves), the famous site where many slaves were held, mistreated, and eventually shipped to The New World for a life of slavery. As we gathered for a guide to give us the history of the site, the mood got noticeably more somber as people realized the significance of the site. Learn more about the House of Slaves here. Then, we had a chance to explore the island ourselves. We went into the house where we saw the rooms where men, women and children were separated and held in harsh conditions. There was a room where thousands of people from around the world had signed their name or written messages in different languages. I wrote my name on the wall and looked around as other delates did the same. 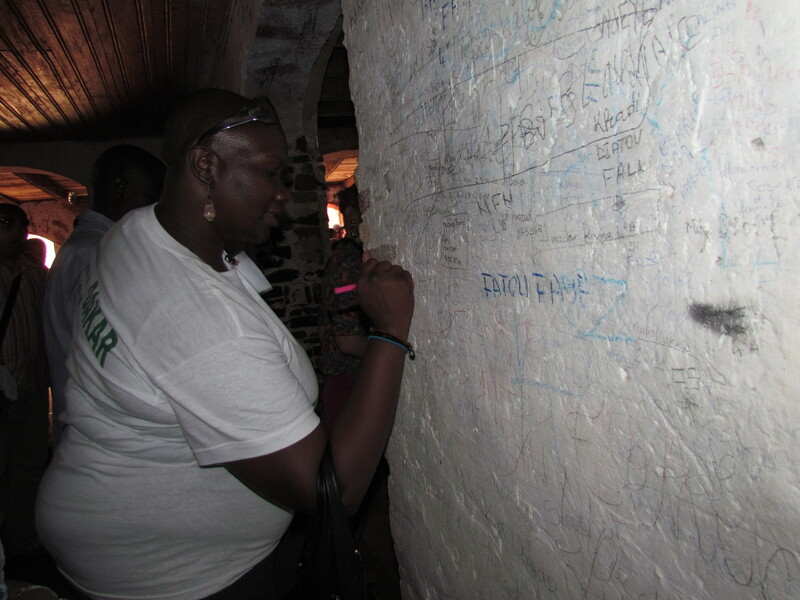 Cicely Bland was signing her name on the wall with Assistant Minister of Tourism and Culture of Liberia, Aissa Bright and I noticed they were both having a special moment. Tears welled up in Ceiely’s eyes as she hugged Minister bright and looked at me and said “That was Deep”. Then, we walked to the back of the Slave House and saw the famous “Door of No Return”. The door from which Africans exited, never to return to their homeland. I was still standing next to Cicely at this point and I asked her: “What are you feeling right now?” and she paused and then said “We’re looking at the door of no return…and I feel like I returned…like my ancestors returned”. I realized then that this site was incredibly personal and emotional to many of the delegates and took some time to reflect on the meaning of the site myself. I continued to walk around the island, and came to a platform with a beautiful view. The tour guide told me that below us was a Private school for gifted girls in Senegal. That’s when it hit me…the meaning of Goree Island. What was once a miserable place, symbolizing the enslavement of African people was now a thriving community. What is the significance of the brightest girls in Senegal getting educated on the same Island on which their ancestors were shipped into slavery? Well, I think it means different things to different people…but to me it symbolizes progress, hope and the Renaissance spirit depicted by the Monumnet from earlier in the day. 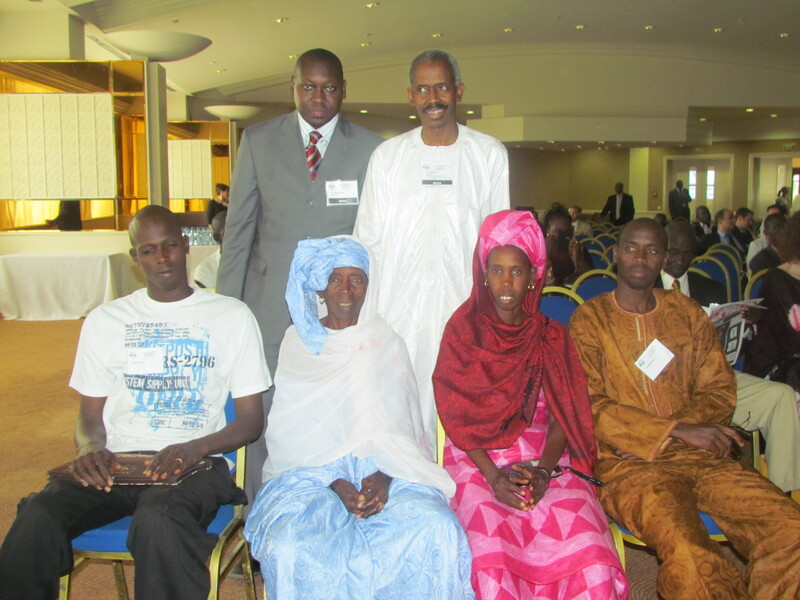 After returning on the ferry, we were all tired, but went to the University of Senegal for a Tree-Planting ceremony. The ceremony is a follow up to the Gambia’s efforts to plant trees in order to make our 35th Annual Congress in The Gambia carbon neutral. After the success of this effort, the Board of Directors added this to the Constitution of ATA as a responsibility of the host country. We planted 20 ATA trees: we planted trees for each ATA chapter, for the Board of Directors, for the ATA management team, for the Young Professionals, for New York University, for the National Tour Association and for the media. My colleague Julia Firestone will share the details of this event in an upcoming blog. That night, we participated in the TICAA Closing Gala Dinner where ATA Executive Director Edward Bergman presented ATA Awards and we enjoyed cultural entertainment including music, fashion and painting. 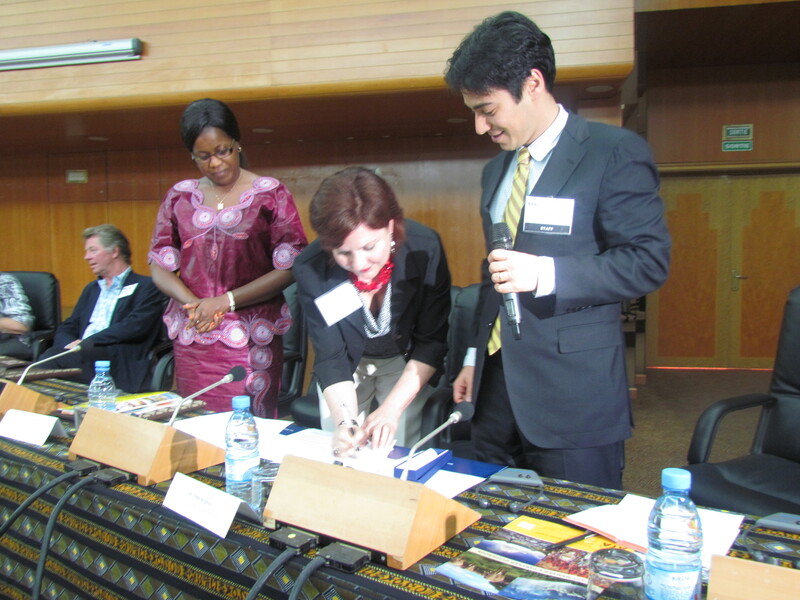 On Thursday, May 26th, Africa Travel Association and National Tour Association renewed their Memorandum of Understanding to work together to promote Travel and Tourism to Africa and advance the missions of each other’s organizations. President of NTA, Lisa Simon participated in an educational session called “Partners in Promoting Tourism to Africa” with Executive Director of ATA, Edward Bergman and Managing Director of London-Based Advancing Tourism to Africa (ATTA), Nigel Vere Nicoll. The panel was moderated by Karen Hoffman, President of the Bradford Group, USA Representative of the Tanzania Tourist Board and the First Vice President of the ATA International Board of Directors. They discussed the importance of strategic partnerships in making progress towards creating a significant positive change in tourism to Africa. 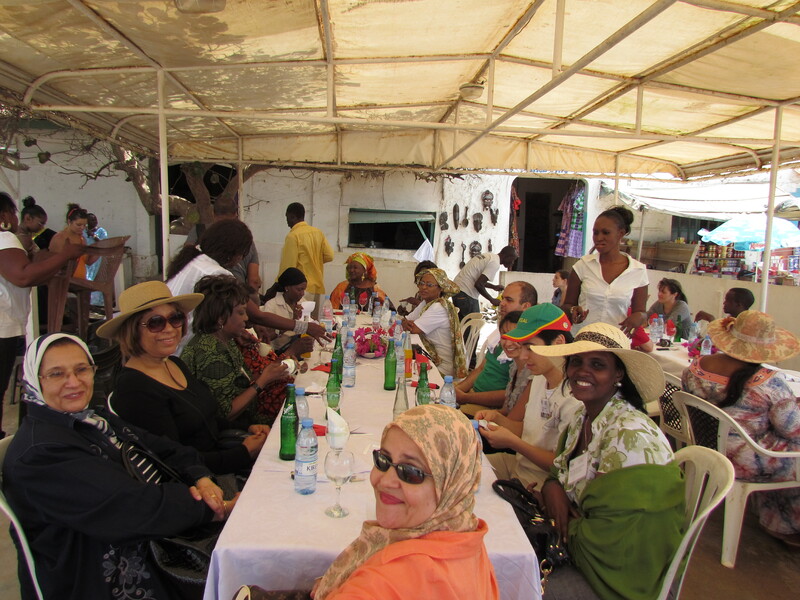 Ms. Simon also participated in all other Congress events including our day at TICAA (The International Tourism, Cultural Industries and Artistic Crafts Fair) and our Host Country Day trip to the African Renaissance Monument and Goree Island. She told me that a highlight of her trip was the tree planting ceremony at the University of Dakar that offset the carbon footprint of the Congress. I found some time to interview her to get her unique perspective as a representative of tour operators and to hear her thoughts on the next steps for the MoU. RD: How do you connect tour operators with Africa? LS: When you look at tour operators already working in Africa, they need unique, diverse and customizable products. It is important to educate the operators on product offerings. Companies not working in Africa need to develop face to face relationships with tour operators on the ground in Africa. The way to accomplish this, African Destinations need to bring representatives to Africa to meet with Tour operators in person. RD: How can we make the ATA Congress more attractive to tour operators? LS: Firstly, they need education. Secondly, they need to know tour operators in the Destination. Meetings with hoteliers or government officials are helpful, but not what the tour operators are looking for. RD: What is a concrete action step that can help move the MoU between ATA and NTA forward? LS: I think the next step is really getting some ATA representation at our Convention in December. We would love to have some ATA members and Board Members at our Convention so we can sit down and discuss what we can do to advance both of our goals. The potential is there, and it will be a multi-year process, but as long as we are committed…we can make some real progress. Hi, everyone. I’m Roni Weiss. 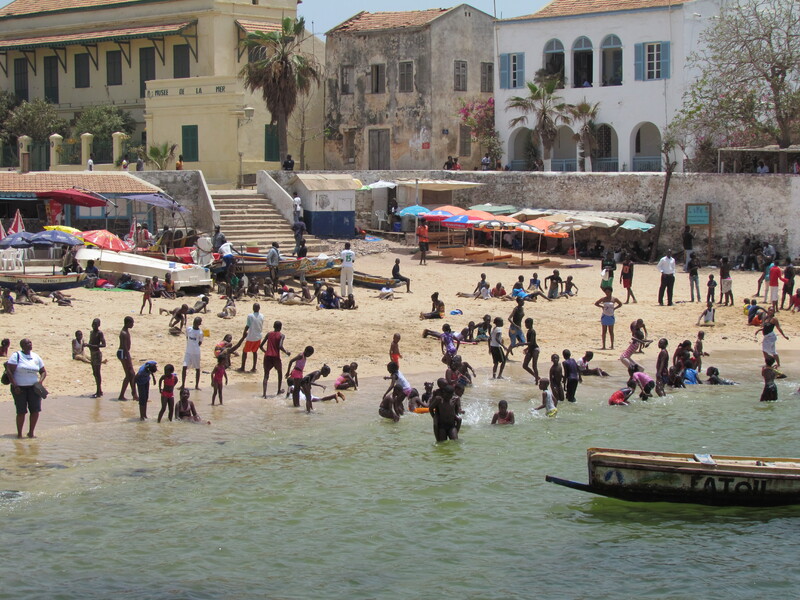 I’ll be talking about some of the things that I’ve found particularly intriguing about Senegal. “Where is Senegal?” was a common response when I said that I was coming to the 36th ATA Congress. Answer: It’s as far west in Africa as you can get. 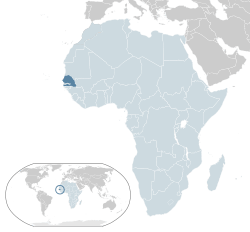 Senegal borders the Atlantic Ocean. Another peculiarity of its geography is that it envelops its sister nation of The Gambia (other than where the ocean takes over). The phrase I’ve heard for Senegambia (a term that has been thrown around a bunch at the Congress) is that it is “one house with two rooms”. OK, so why are Senegal and The Gambia different countries? I was told by a Senegalese guy that this was an excellent question… And then didn’t really get an answer. So, I researched a bit myself. Apparently, they were in a confederation for a good portion of the 1980’s, but it didn’t work out. Despite this, the two countries maintain close ties, as they have a lot of common ethnicity and language. 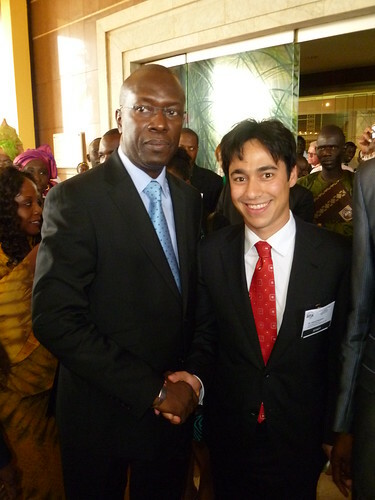 Ogo Sow, better known as Mr. Africa, is a Radio Journalist and Commentator based in Atlanta, Georgia, as well as Advisor to the ATA Executive Director on Diaspora Affairs and member of the ATA board. 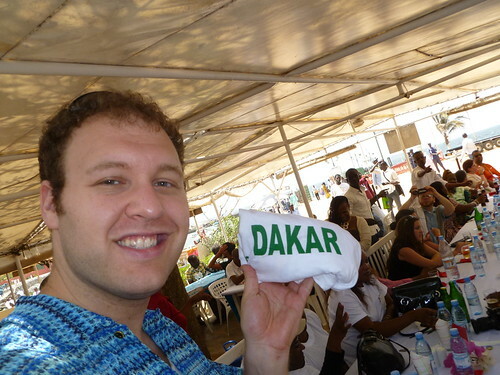 Please view his website here:Ogo has been a huge part of the planning and organizing of ATA’s Congress and this year, Ogo was especially excited because the Congress is being held in his home country of Senegal. Ogo knows everyone…from government representatives to people on the street and every one of the delegates; and his mission in life is to spread his love for Africa and to encourage his brothers and sisters all over the world to experience Africa for themselves– which he does with passion and enthusiasm that is unmatched. In ATA Executive Director Edward Bergman’s opening remarks, he made special mention of Mr. Africa, who is also Edward’s close friend, and recognized his commitment and many contributions to the association. One of the highlights of the opening ceremony (and my personal favourite moment) was when Mr. Bergman invited Ogo and his mother, who travelled into Dakar with other family members just to see Ogo at the ATA Congress, to stand for a round of applause. 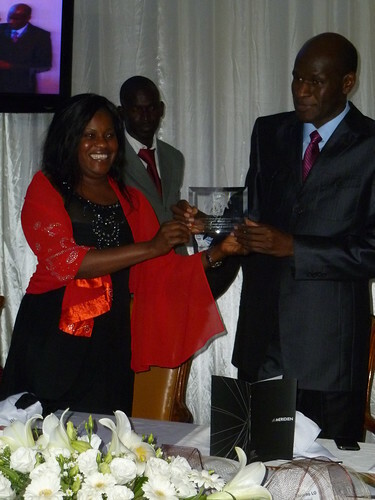 Ogo was absolutely thrilled… and his mom was a little taken by surprise but beaming with pride. Witnessing such a special moment for Ogo and his family is something that myself and the other 200 attendees will not soon forget. Ogo participated in a panel about New Product Development and Branding on Day 2 of the Congress and discussed how best to mobilize and utilize the African Diaspora in America to increase tourism to and investment in the continent. Quick Update: ATA’s 36th Annual Congress Opens!!! The ATA Congress officially opened yesterday with an Opening Ceremony and several sessions. The Opening Ceremony brought over 200 attendees including Tourism Ministers from Senegal, The Gambia, Ethiopia, Malawi, Sierra Leone and Liberia as well as Senegal’s Prime Minister Hon. 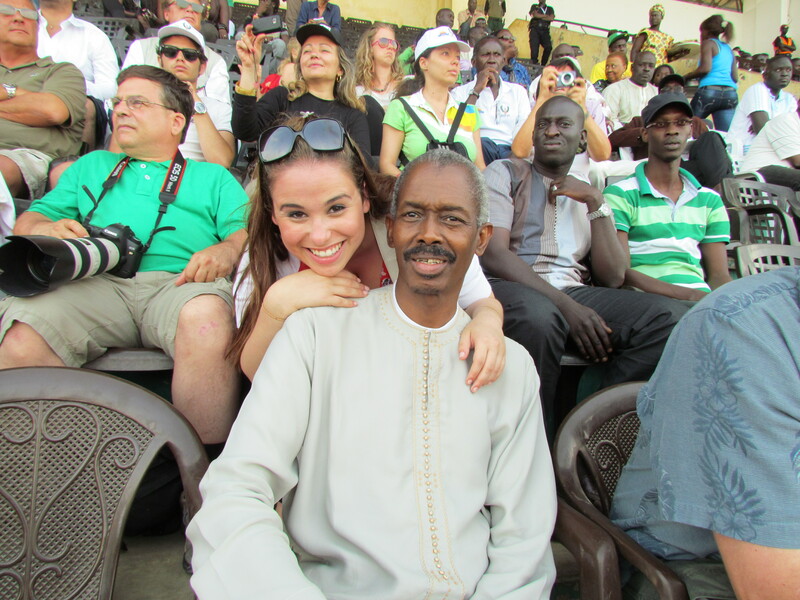 Souleymane Ndene Ndiaye! 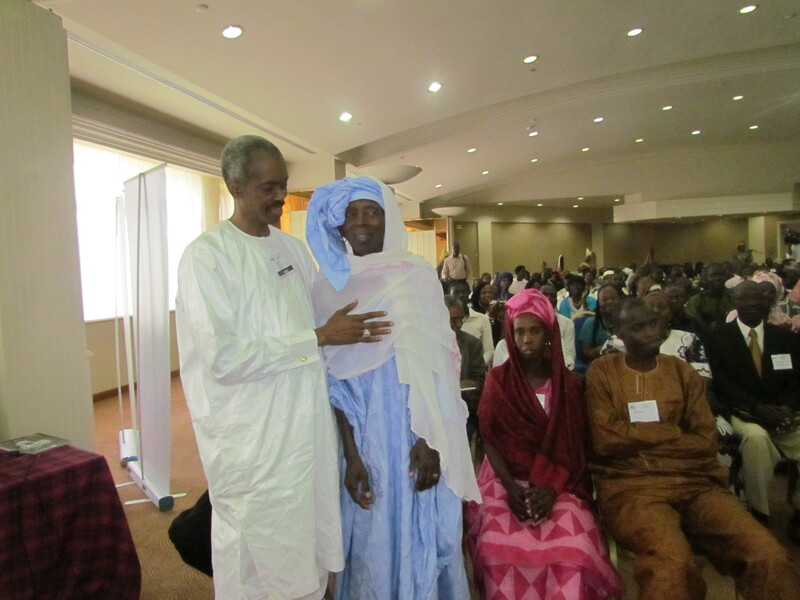 The ceremony included performances by young Senegalese traditional musicians and dancers, who added to the excitement and anticipation in the room. After the ceremony, ATA held 3 sessions including an African Tourism Updated by NYU Professor and the Director of NYU Africa House Yaw Nyarko and a Spotlight on Senegalese and African Cuisine by Chef and Cookbook Author Pierre Thiam. After a full day of programming, all of the delegates celebrated together at a Gala Dinner hosted by our Host Country Senegal. Delegates look forward to more interesting sessions covering important industry topics, our visit to TICAA International Tourism Fair, a Host Country Day including visits to the African Renaissance Monument and Historical and Cultural site Goree Island. Stay tuned for more updates and some beautiful pictures of all of ATA’s experiences! 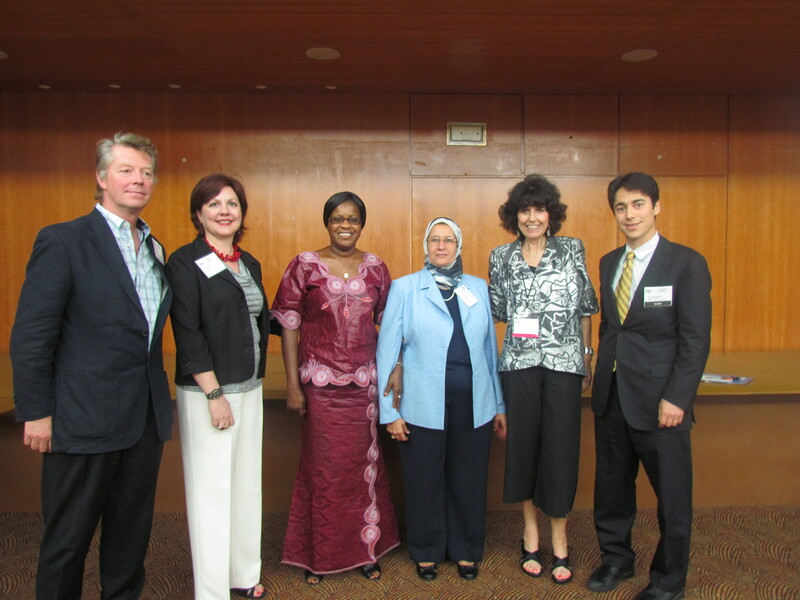 It’s That Time of Year Again…Gearing Up for the 36th Annual World Congress in Senegal! 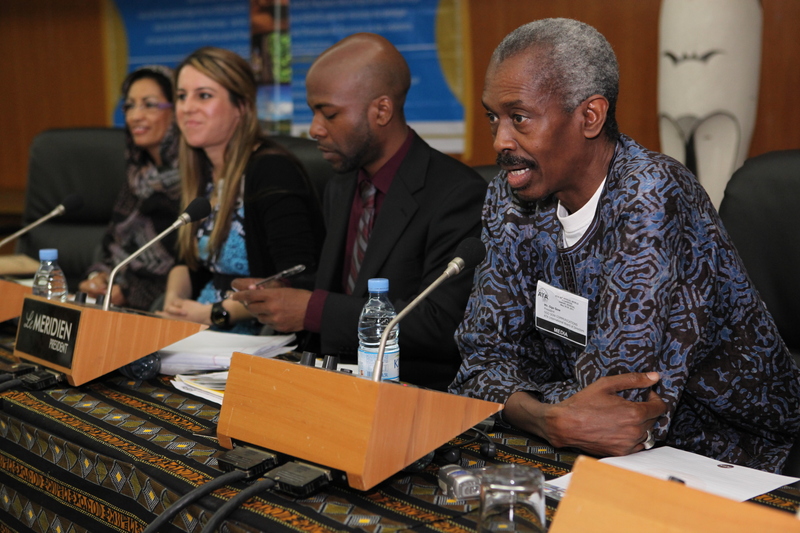 ATA is excited to begin blogging again as we prepare for our 36th Annual Congress in Dakar, Senegal, which will take place from May 25-29, 2011. This year, we will be using Facebook, Twitter, Blogging, Video Clips on Youtube and this blog to ensure that all of you who were not able to join us this year can stay up to date and experience the Congress as we do!! My name is Robyn Deutsch and I have worked with ATA, focusing on Media and Communications for a year and a half now; I will be blogging again this year about some of my experiences. We are also very luck to have New Media Journalist Roni Weiss joining us this year. He will bring his expertise with Social Media to our team and help us with our Twittering, our Video Journals and this blog!! Andrea Pappito, an intern and close friend of ATA will also be joining us and guest blogging about some of her favorite experiences. We love to get comments…so please share your thoughts, your requests for topics to cover and your well wishes for ATA’s 36th Annual World Congress to be a success! Next time you hear from us, we will be in West Africa! !